on the left side? Child’s play, in comparison. Eleuthera? It wasn’t even on our itinerary. Yet it was one of my favorites stops of our Bahamas cruising season. We went there on just one cruiser’s recommendation, and simply because it was a logical stop on an alternate route back. 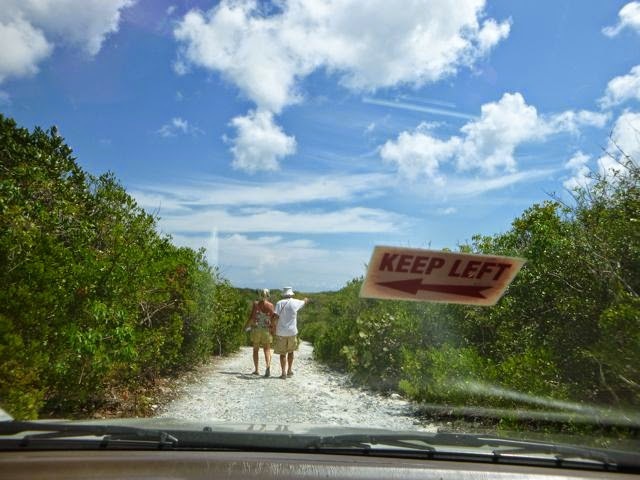 Sure, we love the Exumas, and agree if time is short, that’s the “don’t miss” destination of the Bahamas. How can you bypass a place so exotic they’ve shot Bond movies there? And cruising the remote Raggeds and Jumentos are worthy of bragging rights, given how relatively few of us make there to enjoy its pristine splendor. Yes, undeniably, they’re right up there in our Bahamas winter 2013 - spring 2014 cruising season hit parade. We understand why fisherman flock to that area, cruisers bond with each other and those few hardy and hospitable locals lucky enough to call that area home. Exploring Eleuthera's Queen's Baths before we took a dip. But Eleuthera? We didn’t know a darned thing about it, other than how to get there. And so we did. But then what? Enter Trip Advisor (click here for their great list of Eleuthera “Things to Do”—well worth combing not only for ideas but also for explicit directions to otherwise almost-impossible-to-find-places), a keen sense of adventure and our equally adventurous buddy boaters Ann aka Krazy Lady and Andy of sv Amante, and two very full days with Wayne’s exceptional dirt road (really -- off road) rental car driving prowess. Plus, thanks to Ann and Andy, we doubled our fun, and halved our rental car costs. How can you not love that? Ok, I’m giving Elethera short shift here – we really spent 2 ½ weeks there, from April 19 – May 6th, and loved it wherever we explored (see these GWT Elethera blog posts Healing Hole of Rock Sound Bygone Splendor – Elethera’s Royal Island Hobnobbing in Harbour Island Bahamas Green Hot Rods -- not to mention kayaking sweet Spanish Wells and its Gonpoint Park – a future picture post if my photos are recoverable, ditto Governor Harbor’s Levi Preserve near the fabulous pink sand – aqua water beach of French Leave). Our other forays there were mostly more leisurely explorations by foot and sea. 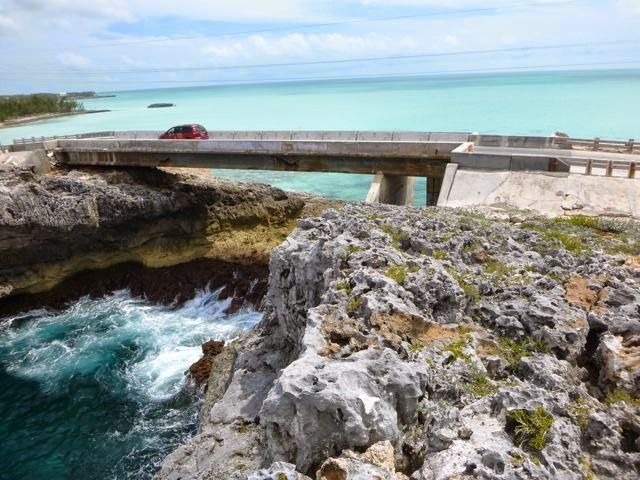 But it was the road trips where we most eagerly and exhuberantly embraced Eleuthera in broad, glorious gulps. 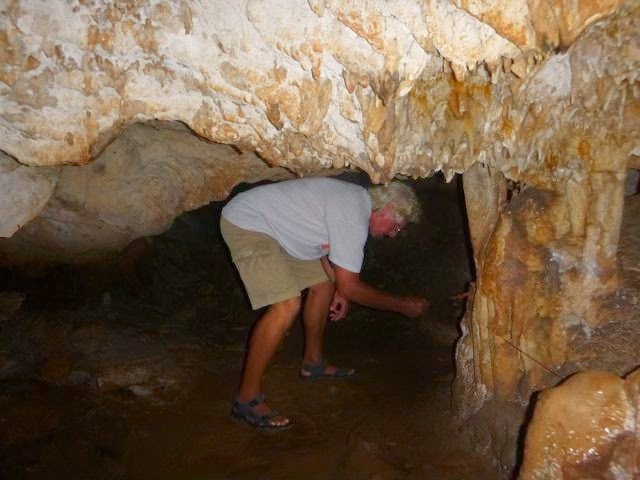 Eleuthera's exquisite Hatchet Bay Caves. We took one trip from hurricane hole Rock Sound, south… to batty and otherworldly Spider Caves, touring Cape Eleuthera Institute (a marine research school), where we were tipped off to a “cuppa” (watch for a future blog on that) and braved the long bumpy dirt road road to spend the afternoon at lovely Lighthouse Beach, where a large out-of-season lobster taunted us with his cha-cha dance. We took another lengthy day road trip from little Hatchet Bay to the long and twisty Hatchet Bay Caves, down another car-sized potholed dirt road to Surfer's Beach, then to Queen's Baths during low tide to lounge in the baths, to beautiful Glass Window where the Atlantic Sea and Exuma Sound collide under a bridge, stopped at some other cool yet unnamed Heritage Spot near Rainbow with musical rocks along the trail there, culminating where unreachable rocky caves precipitously perched, spectacularly overhanging a clashing Atlantic coastline. Our final stop of the day took us all the way back to Governor’s Harbour. I insisted on finding the beach simply noted in our Explorer Charts as "Pink Sand Beach." Wayne and the rest of our menagerie humored me beyond reason. We wandered, well. lurched, aimlessly at least 15 minutes along rough, unmarked roads, doubling back and forth without a clue. 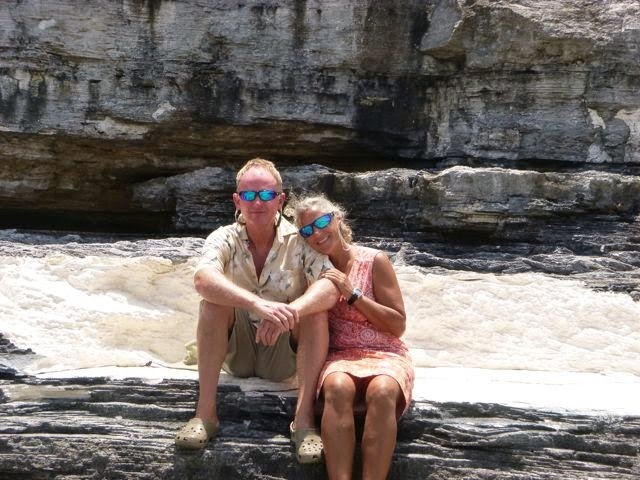 Wayne and Dana sitting on the "throne" at Queens Bath, Eleuthera. Against a deep periwinkle-clouded sky was the pinkest sand beach I’ve ever seen. Pinker than Valentines at Eleuthera’s exclusive Harbour Island. Pinker than Barbuda (though Wayne disagrees with me on that). Again, that brilliant aqua water, creating a purple swirl where the waves tumbled the powdery soft pink sand. There was even a blowhole, geysering up with great mournful sighs. Magical. Amazingly, we had that long, lovely stretch of beach to ourselves. You’ll have to take my word for it; all three of our camera’s batteries burned out in a glory of day-long photo orgies, by the Rainbow Heritage site. They were spent, even before we were, or at least before we were willing to call it a day. Exuma Sound meets the Atlantic. If you get the chance, go to Eleuthera and surrender yourself to its exotic beauty. If you go only two places there, make the effort to take the roads less traveled to Queens Bath and to try to find Pink Sands, between Governor’s Harbour and French Leave Beach. Finding Pink Sands and Queen’s Bath was my most perfect day in our whole season of cruising. What was your most magical travel “moment”? Please share! BAHAMAS retrospective. 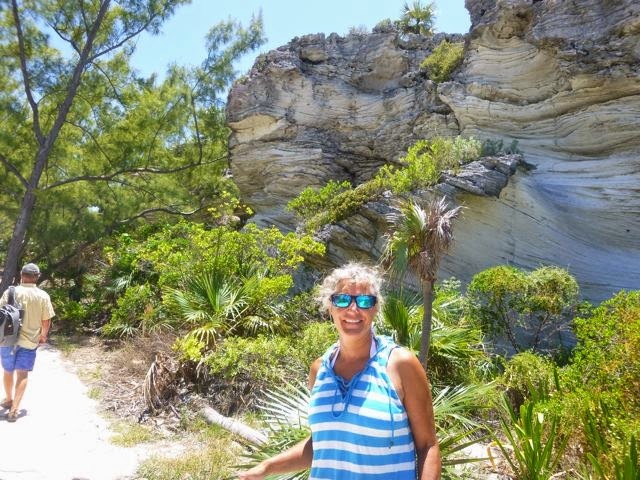 This blog post is a recent retrospective of our visit to Eleuthera, BAHAMAS (N24.44.044 W76.14.45 - N25.30.807 W76.50.884) April 19th - May 6th, 2014. My hard drive is finally happy but most of my recent cruising season photos are still inaccessible. Please wish me luck with that! We are currently working over hurricane season in Jacksonville FL; this time with our boat “on the hard” in Green Cove Springs, until just before we leave in November, bound for the South Pacific via the Panama Canal.